Back in 2013, I was spending an unhealthy amount of time on Twitter. And at a time, I was really into the caricatures. Instead of checking every site I know if there are any new caricatures, I thought wouldn’t it be great if there was a Twitter account that “tweets” new caricatures every day. And actually, there were such accounts. The problem was that those accounts weren’t relevant enough, and shared same caricatures over and over… And most of them were running actively only for a couple of months. Because after a couple of months usually, the owner of accounts got bored and didn’t want to continue. So to have an account without an owner that gets bored easily, I thought we should delegate this task to the bots. Because it was a weekend project, I didn’t want it to cost arm and leg. I knew that if I want the bot to be a long-running show, it should require minimum as possible time and resource from me. Obviously, it was a long time ago since I started the building it, and I can not recall all the details of the process. But I remember that back then there was built-in support for OAuth in GAS, so it was relatively easier to build a bot. And there was another service that called ScriptDB in GAS. Basically, it allowed scripts to have databases and store data in it. I’ve used ScriptDB to keep track of the caricatures to check if bot already tweeted the picture before or not. But both of those services deprecated, I had to replace those parts along the way to keep bot functioning. When ScriptDB deprecated I started using Parse.com. Do you remember old, good Parse.com? The one that Facebook bought and killed after a while. After the fate of Parse.com, I gave up on third-party databases, and since then I’m using Google Sheet as a database of the bot. Since the launch of the bot, it saw a couple of iterations. Right now it’s on 3rd version. After the latest update, now it has little web dashboard where you can manually post, or check the time of scheduled events, or check for the connection status of the social channels. You can set “triggers” on Google Apps Script file. I’ve set up a trigger that runs in every hour and executes the GAS function that checks websites to see if there are any new caricatures posted. 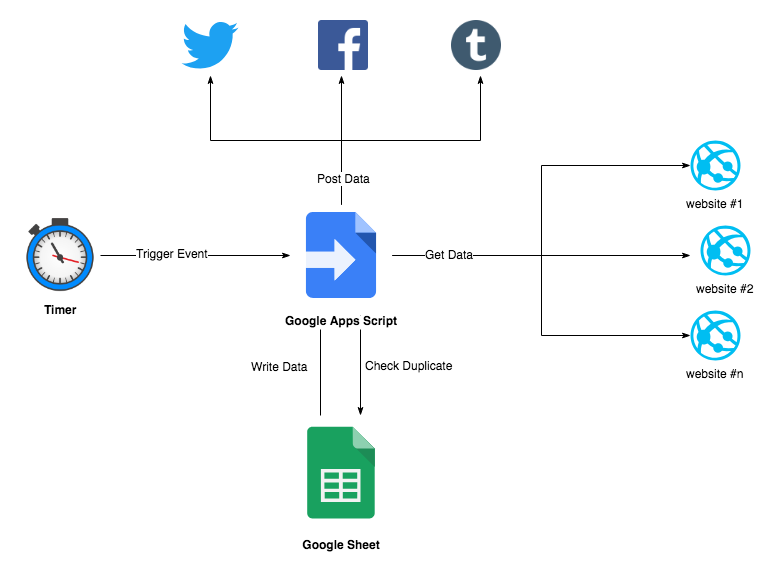 When it founds a picture, first it runs the picture through the database (Google Sheet) to check if it’s a new picture or not, if so, then posts it to the social channels and writes back to the database for future references. // Set the endpoint URLs. // Set the consumer key and secret. Honestly, up until this year’s Google I/O, I didn’t realize why this project appeals to me so much. But, after watching one of the presentations on Google I/O ‘18, I realized that I like this architecture and project because it’s serverless. And the fact that I was using serverless before even it was a “thing” made me love this project even more now. So after 5 years and 11.3K caricatures that posted, I would like to think about this experiment as a successful one.